Reboot, restart, rebirth are important themes in my work. When I was asked to start the New Year here with this theme, I did not hesitate to say yes. I actually jumped up and down. As an artist, I work a lot with found images, text, and paper. I buy antique postcards from the vendors on the banks of the Seine, I save the tissue paper from shoe boxes, friends hoard old and new magazines for me, and I have been known to loaded-up my bike’s basket with books I find abandoned on the street. I’m particularly drawn to the texture and color of old paper and the idea of making new from old. 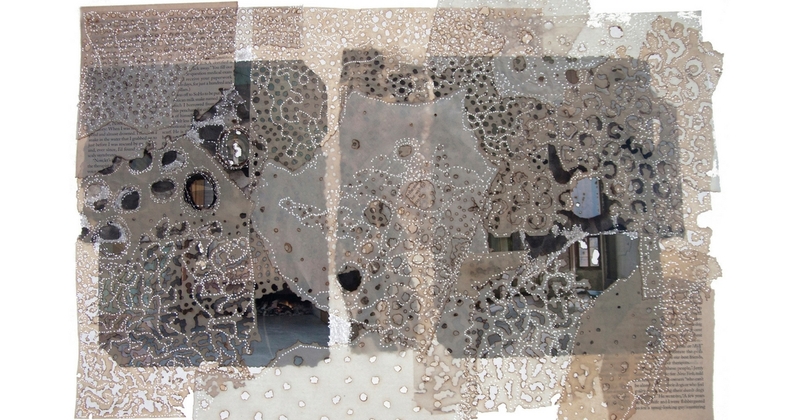 Stitching together tiny fragile pieces of the past. Rebooting forgotten bits of cardboard into large paper quilts. Rebooting and recycling these pieces of the past is something I naturally do without even thinking. My work both embraces and rejects the postmodern idea that everything has been done before and nothing is original. I often start projects from existing images that I find in books, magazines, and postcards (because everything has already been done) and I manipulate them digitally and physically (to be something else). A reboot. 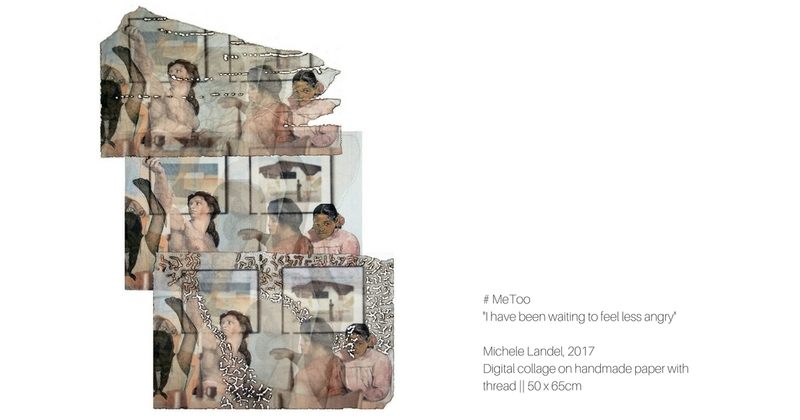 In my #MeToo series, I use this technique to examines the question “can you separate art from the artist?” I cut women out of classical and modern paintings and seated them together around modern dining room tables. These women are so familiar: the curve of their breast, the shape of their thigh. Yet we don’t know their names or the sound of their voices. I want to give them voices and allow them to join in the conversation many of us are currently having online and in person. I repeat the image to represent the reverberation and rebirth that happens through these conversations. The paper is torn, burned, and sewn together to show both the fragility and strength of the women through the paper itself. 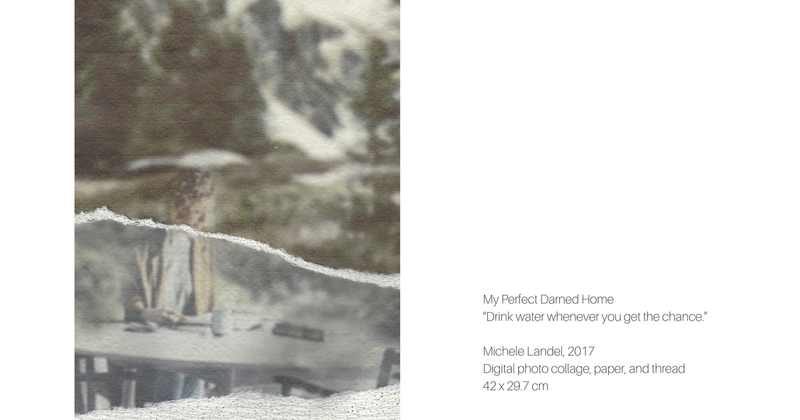 In my Perfect Darned Home series, I am challenging the search and desire for perfection in our everyday lives. I have taken people from tightly controlled photographs in interior design magazines and digitally rebooted them by layering the people and their personal belongings into wild, un-curated landscape. 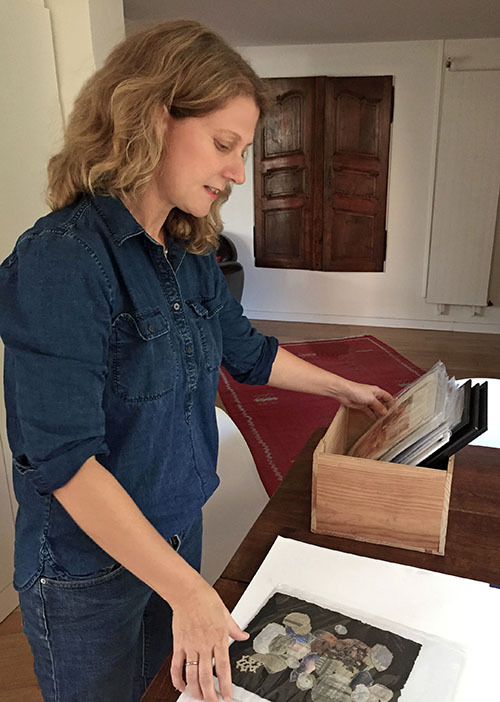 I print the images on different textured papers, blurring some layers and leaving others focused. The layers are again torn, burned, and then sewn together to show that the perfect anything is self-constructed and self-imposed. My needle tears holes in the paper but by going repeatedly back and forth the paper and image is repaired and held back together (darned) by the thread. For the next month, I will continue to explore “reboot” here at The Wild Word and I look forward to seeing what comes out. Thank you for joining me. Discover more at www.michelelandel.com and Instagram @michelelandel.